Every time I reach day 39 on my long hikes, I like to think of it as a “Survivor Day” since that’s how long the show Survivor lasts. This survivor day was pretty simple as it was a nero to town, but it turned out to be quite eventful. We got out by 6:30am and it was much warmer already than it had been up top of the cliffs about 2,000ft higher. We were quite thankful that we got the down climb done last night since we had 5mi of highway walking and it was getting hot quick today. We started off with a couple miles of dirt road walking. When we reached the highway, we dumped all the sand from our shoes. I’ve been stretching out the sock supply since they get holes quick in all this sand. I purposely wore the crummy socks this leg knowing all the sand and water we’d be going through would destroy anything I wore. 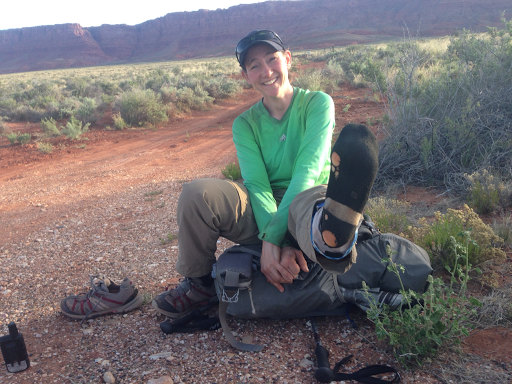 I think these socks are pretty much done for…I’m also excited that I have new shoes waiting for me in Kanab. It has been just over 600mi and the Montrail Masochists have held up pretty well, but now have no tread and many holes, so the new pair is perfectly timed. I love that the Vermilion Cliffs and the crack we hiked down is in the background here! We walked on Hwy 89a and it was pretty dead. We were about an hour from Kanab and were sooo grateful that we had Lori picking us up. I haven’t gotten much phone reception on the Hayduke, but with the Delorme InReach satellite messenger that I have for emergencies, I noticed I can text anyone pretty much anytime when it can get a satellite…which is just about everywhere but in a narrow canyon. It is gold and I love it!!! We were able to message Lori with our exact eta to meet us on the highway. It was a beautiful walk and I rocked the MP3 player and loved it. I was also able to multi-task and get some blog stuff done. Can’t ask for much more on a road walk. Just before Lori, picked us up, Katherine (who was just a mile or so ahead of us) came by with her hitch. She said it took here a good 45mins, so not the easiest hitch in the early morning. 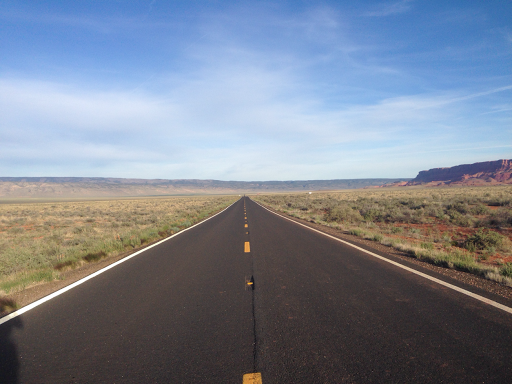 We counted just 5 cars heading toward Kanab in the two hours we were on the road. 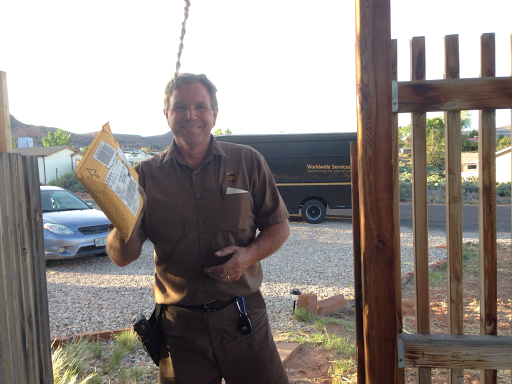 Lori arrived right on time and we drove by Jacob Lake on the way to Kanab. The official Hayduke goes right through it, but our alternate has us missing it. 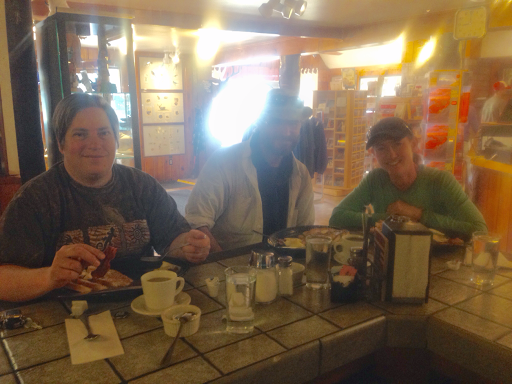 Good news is that we got to have breakfast there with Lori and it was wonderful! Neither of us even considered breakfast as an option and it really hit the spot! 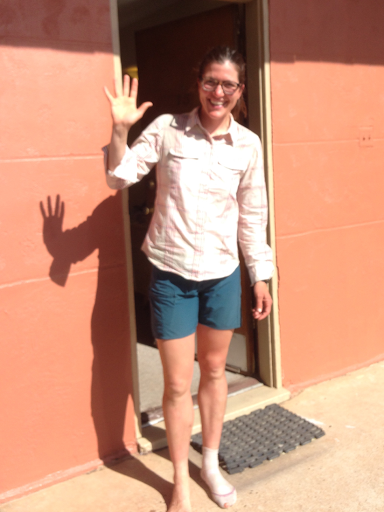 We headed back to Tumbleweed’s house who hosted us just before this leg. 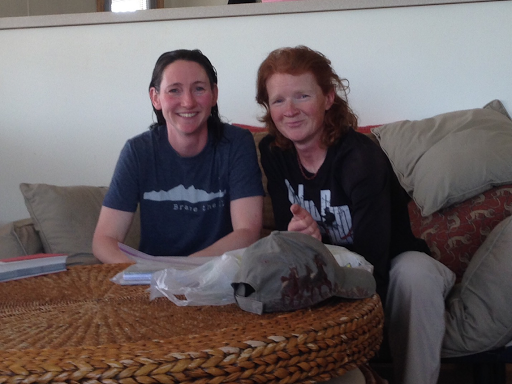 It has been AMAZING to have Trish and Lori in this town where we ended up taking a double zero and did our bonus Buckskin/Paria alternate that had us loop in such a way that we’d come into Kanab twice. Just sooo great! All trail and before the Hayduke, I’ve been in touch with other hikers along the trail. As far as I know, there are 13 thru hikers this year. Four started weeks before us and have pretty much finished. I’ve met the rest of the hikers except for one I’ve been keeping in contact with. Her name is Wyoming and she started a week after me and Katherine. To our knowledge, she is the first solo female to possibly complete the Hayduke, BADASS!!! She is also doing the trail mostly map and compass with a GPS that has no tracks on it just to verify where she is when needed. She also doesn’t hike with a phone, which I just can’t imagine, especially hiking solo! 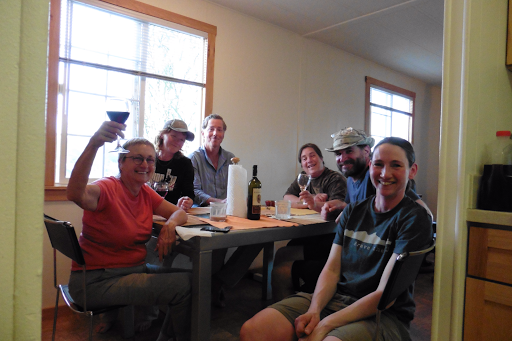 Through the wonderful world of thru hiking, Wyoming was connected with Tumbleweed and is also staying here tonight. We were both quite happy to finally meet in person after being in touch these last few months over email and phone. 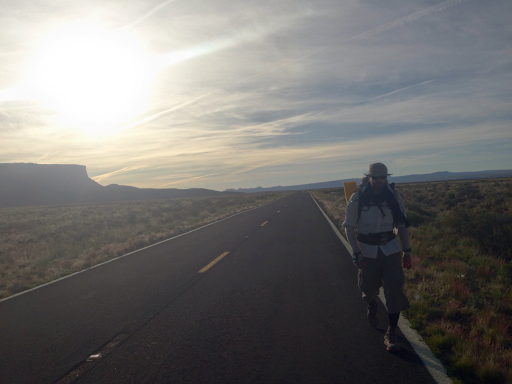 So pumped and inspired by Wyoming (she doesn’t keep a public blog sadly). We have mutual hiker friends and I’d heard of her since she hiked the CDT solo in 2012 and I was researching for my CDT hike. Just great to spend time together and the way our schedules are, there is a chance we may see each other again later in the hike. Back at Tumbleweed’s house, she was preparing dinner when I got a call from Freebird, who we met twice earlier this hike. He is friends with Wyoming and neither of them have a phone, so they creatively connected through me. It turns out that Freebird is also in town. I had also heard that Busted Magic and Wade were in town too. That makes 7 HDTers in one town, which has to be a record! 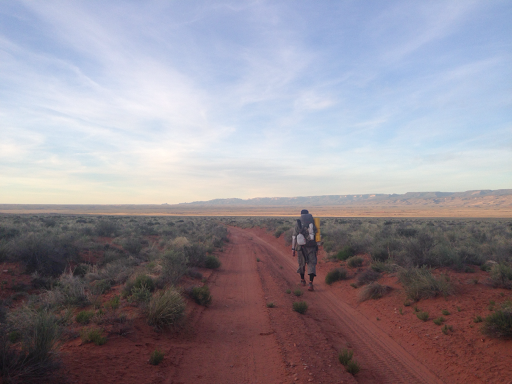 Kanab is unique as it is placed in a way that hikers can hitch in and still be days away from each other on the trail. Freebird joined us all for dinner and it was a full table. I was slightly anxious since I had ordered a new camera (to replace the one I lost three days ago) and it hadn’t been delivered. It was due to be delivered by 8pm and at 7:40pm, the UPS truck arrived! I raced out and got a photo of the wonderful event! It was perfect timing and the first photo with the new camera was of our gathering at dinner. Another great town stop in Kanab! It’s 11:30pm now and I need to get to sleep. Thankfully, we opted for a shorter hike out tomorrow to give us a relaxed leave on this upcoming 9 day leg into the Grand Canyon…I feel like the drum roll is going strong and I’m pretty excited to see this place I’ve heard and seen so much about yet, can’t even fathom hiking through! Awesome that you featured Wyoming!